Cards Against Humanity has another 'wacky' Black Friday stunt, and this year it's the Holiday Hole, a crowd funded excavation project. Some have tried to compare this hole to dystopian malaise that's struck a national mood. Arguing that the outrage of those who throw their money away is a symbol of much more. I think the hole is funny. The end. I've been up to Lummi Island a few times, to celebrate a birthday with a particular friend of mine. Usually it would involve driving up to Bellingham, hopping the ferry to Lummi, and driving straight to his house. This time I took in a whole weekend on Lummi, drove extensively (i.e. 9 miles) around the island, and got to dine at the headlining attraction on the island: The Willows Inn. As someone who partakes in about every episode of whatever Anthony Bourdain's show is called now, as well as big fan of Mind of a Chef, my first big fancy tasting meal was probably long overdue. The hype on this place is huge: James Beard, New York Times, etc etc etc. Let me walk you through our evening. We arrived for cocktails, mine was a gin, snap pea and cucumber drink (which is eerily similar to the color of Cucumber Lime Gatorade). It was crisp, refreshing, and damned if it didn't have the aroma of snap peas. Oysters from Samish Bay, peas with some sort of dust, lamb proscuitto and cherry tomatoes. Cocktails of course have no prices listed on the beverage menu, which is a little concerning, but even more concerning when the plate of snacks arrive (which you don't order - it's just brought to you). No explanation other than, these are snacks. The oysters were perfectly tender and expertly shucked, leaving all the not-too-salty liquor inside. The peas had this sweet sugar dust on them, and the cherry tomatoes were perfectly ripe. Check that presentation: oysters perched not on a platter of ice or rock salt, but on rocks, just like you'd see on the beach. It's at this moment where you start to realize that yes - this dinner is going to be something special. The dinner is timed with the sunset, so you're ushered in just as the sun is coming down. The head server grabs everyone from the cocktail deck one party at a time. There looks to be two dining rooms, one in the back and the other in the main area. You sit down. There was a mussel in there. You sit down and a few moments later, someone brings you this warm, smoking box. They pour you a champagne flute worth of local hard cider (from Eaglemount Cider just across the Sound). You open the box and realize that the mussel inside which had obviously just come off the smoker is opening and pushing the lid of the box open on its own. The mussel didn't last long enough for the picture, but it was tender and perfect. Then a few moments later they bring you the plate of flowers, along with a remoulade sort of sauce to dip the flowers in. These aren't fried or stuffed blossoms, they're just flowers. The staff is ever attentive. You start to see that other tables are ahead of you, some are behind. Your table is cleared and a new treat is dropped off. Next it's a kale chip with black truffles. Kale, the evil cousin of lettuce, has a slightly bitter taste that goes perfectly with the dollops of truffle. We're still in the "snacks" portion of the evening by the way. While you're waiting to finish your second bite of kale, the Crispy crepe with steelhead roe arrives. The server tells you to do one big bite and he's right - it's luscious and creamy inside. It reminded me of one of those ham/cream cheese roll ups from awful party platters, except delicious in every way. They follow that with halibut skin with a halibut mouse of some sort tucked inside. Halibut skin, Chicharrón style. Darker is from the belly. Suddenly, it's dinner time. You don't really notice the big change but it's your first non-snack, a raw slice of local albacore, in a semi-gelatenous broth made from the smoked bones. There's a hint of horseradish, and the bites of fish taste like the best sushi you've never had. The smokey broth brings the right amount of salt and flavor to the delicate fish. Then they bring you a fire roasted shiitake, which if you are facing out the south side of the dining room, you'll see someone roasting and then running into the kitchen just a few minutes before it arrives on your table. Soon after they brought us beets which were baked in salt, with a spoon full of some kind of yogurt sauce. The beets weren't too sweet, had the residual salt from the baking process, and it balanced well. Then it was on to some meat. An aged venison tartar, some fresh baked rye crackers, and a sprig of purslane. The instructions were to spoon some venison on the cracker, top it with some purslane, and then devour. We did that. Aged venison, cracker and purslane. The assembled venison taco thing. We ate the crackers and venison, but ended up with about one spoon left of venison, but short a cracker. The staff offered us another cracker, and instead brought a whole new set. Then another came out and said the crackers looked too lonely, so he brought another crock of venison as well. These were amazing. the purslane went with the tartar perfectly, and the crackers' buttery richness paired with the venison as well. Then we went back to the smoker, this time fish again. A bright red wild sockeye filet caught on Lummi Island, coated in a sweet glaze, and a buttery piece of cod. Sockeye and Cod, fresh from the smoker. I apparently neglected to get a photo of the wild seaweeds braised with Dungeness crab. It was subtle and sweet, briny from the seaweed and delicious. It didn't last long on the table. A box of bread was brought out, fresh from the oven, served along salted butter and chicken drippings (think the liquid in the tray under the rotisserie chicken you get from the store). Bread, butter, and chicken drippings. The butter was soft and fresh, the bread was a bit rough around the edges but soft and warm. The chicken drippings were an interesting choice. They're super rich, which is a big contrast to the lightness of the rest of the meal. We recently dined at Bar Tartine in San Francisco, which has bread that apparently is worth writing about as well, but I don't know if either are anything you need to be overly concerned about. Put it this way, don't go all the way to Lummi Island or San Francisco for bread. Rockfish steamed in parsley and lovage. The rockfish came out next in its very fancy container. This was the least favorite dish of the night. The fish was perfectly steamed, but the greens were just a little too pungent. It over powered your sense of the fish with the noxious sort of greens smell (think, over cooked spinach from your childhood). The sun will be about here at this point in the meal. Looking west towards Orcas, Matia and Sucia islands. If there was going to be a main dish for the night, this is it. The slow roasted leg of lamb, cooked en papillote (which means 'in parchment' en Francias). Slow roasted leg of lamb. Served with cherries, a fresh herb topping, and parsnips from the garden, this thing was delectable. The meat was deep in flavor, and the cherries balanced out the sweetness. The meat was incredibly tender, flavorful, and an amazing finish to this tour de cuisine. Then it was pre-desert (a concept I'd like to see more widely adopted), which was fine for me, but my dining companion's least favorite of the night. Local berries in a grass broth. The berries ranged in ripeness and tartness, but to me seemed to balance with the natural sweetness in the grass broth. Yes, grass broth. A little like the wheat grass you try once at Jamba Juice, but paired with these berries, it seemed to go together well. Then it was actual dessert: warm blueberries with woodruff and malt. Blueberries and malt. Dollops of merengue-ish and ice cream I think they said was lovage, possibly purslane again. The final dessert had the sweetness from blueberries, balanced with the malt crumble. It was not overly sweet but had the freshness and lightness that carried through the whole meal. It was an incredible experience. I'll probably never have food like this again, so I'm glad I got to enjoy it here. Everyone at my friend's party asked me if it was worth the cost (which was a lot) and we all said it was - once. It was the embodiment of years of watching Top Chef and Bourdain and David Chang on television. It was fun to be at the whim of a chef, able to execute his vision of the meal from start to finish. This kind of experience isn't something I'm likely to see again for quite some time, so I am glad that it was incredibly enjoyable. All told it was two and a half hours of a dinner unlike any other. I don't know if you should fly to Lummi just to eat there, but if you're in the neighborhood and have any interest whatsoever in this, you won't be disappointed. And you'll eat a bunch of flowers. My family is gathering for a delayed Christmas, and so I decided I'd make a cake. I decided on the Momofuku Milk Bar Apple Pie Layer Cake, from the cookbook of the same name. It's a complex recipe, and required some special equipment from Amazon to get everything in the pan. Essentially it's a brown butter cake, layered with liquid cheese cake and apple pie filling, along with pie crumb (pie crumb is to pie crust what Dippin' Dots is to ice cream) and frosting. It was a two day baking affair, with most of the components made the night before the day before we were going to eat the cake. First up was the liquid cheesecake. The cookbook says this is like cheesecake, but liquid and pliable. That's fairly accurate. It's basically cheesecake, but you bake it just a little bit so it's not quite a complete custard, but more of cheesecake goo. It's a pretty damn fine tasting cheesecake. If you make anything Momofuku, you'll quickly learn that accurate measurements are important. Hence the digital kitchen scale - probably one of the most important things to have in the modern kitchen. Measured out for liquid cheesecake. This is how they said to bake it. I was skeptical. You bake the cheesecake liquid in a contraption that won't make a lot of sense. It's plastic wrap in the oven. Now, maybe I didn't use the right kind of bakeware, but hey that's my problem. But, the plastic didn't melt as much as I feared it might, and it just sort of will shrink wrap itself to the glass. All the plastic was accounted for at the end of the baking. You only can tell it's done based on kinetic jiggling tests. If it jiggles a little in the middle but not on the edges it's done. I guess. It's done, but it may not look that done. But it is done, because I was done with it. Next up was the apple pie filling. It's a pretty standard apple pie filling, made from apples and pie filling. First you cut up apples. These strange shapes used to be apples (a fruit). The recipe calls for a little lemon water soak for the pieces of apple, which prevents browning (due to the acid in the lemons). It doesn't impact the flavor at all, so don't worry you dummy. Grab yer apples, add them to sugar and butter then apply heat. Deliciousness ensues. Apparently I didn't grab any photos of the making of the pie crumb. But basically, you're mixing up flour and salt with some melted butter. It forms little clusters, and then you put 'em in the oven. That hardens them. And makes them warmer. The pie crumb, taken out of the oven. Once they cool they get put somewhere (your choice) and then half of them end up in the frosting, half end up in the cake. But more on them later. That was all I made the night before. The pie crumb can stay out at room temp, but the other stuff took a slumber in the fridge. The next day it was on to the cake, and most importantly the final assembly. Again, accuracy is your friend. And also your other friends are your friends too. The brown butter cake involves some brown butter (which they have you do in a microwave, which is pretty crazy. It starts popping and sounding like an explosion, but sure enough it browns. The cake takes a pretty standard creaming method, but then it adds in buttermilk, eggs, vanilla. It's a lot of liquid. But the cake flour balances it out. Creaming action shot. Or mixing action shot. Hard to tell. The cake goes into a quarter sheet pan, which was one of the special equipment bits I had to purchase. I think it was about $6 on Amazon. So if you want to make this cake, you should plan in advance. It's a piece of cake to bake a pretty cake. Next up I made the frosting. But I neglected to take any pictures of it. Here's what you should know about the frosting: you blend the pie crumb with some milk to turn it into a paste of sorts. It all sounds crazy, I know. But it turns out to be a nice frosting with a lot of salty/sweet balance. The frosting is made with sugar and butter. Duh. The last component I needed to make was the apple cider soak, which is made from apple cider and soak. It was for adding to the cake layers in the final assembly. A little extra dose of magic sauce. It's apple cider, a pinch of cinnamon, and a teaspoon of brown sugar how come you taste so good? Now it's on to final assembly. The cake has cooled, I turned it out on to the counter and then cut out the two rounds that will be layers 2 and 3. The six inch cake ring was special equipment piece #2, and makes perfect six inch cake circles. Where did the rest of the cake go?! The magic cake ring is then placed on a sheet pan with parchment, and then you take the non-circular bits of cake and assemble them into a round layer that would make any geometry teacher proud. The quarter sheet pan makes two six-inch circles of cake and one six-inch mess of cake. Next the soak was added, brushed on delicately and sweetly. Then it's half the liquid cheesecake, topped with 1/3 of the remaining pie crumb. That's pie crumb on top of liquid cheesecake. That's apple pie filling on top of pie crumb on top of liquid cheesecake. The other magic equipment in the recipe is acetate. What's acetate? Well, some call it cake collars. I call it overhead projector sheets, which is what I had to order because the proper cake collars wouldn't arrive in time. I cut the 8.5x11 sheets into long strips and had to use two strips on each layer of acetate, but I think it worked alright. 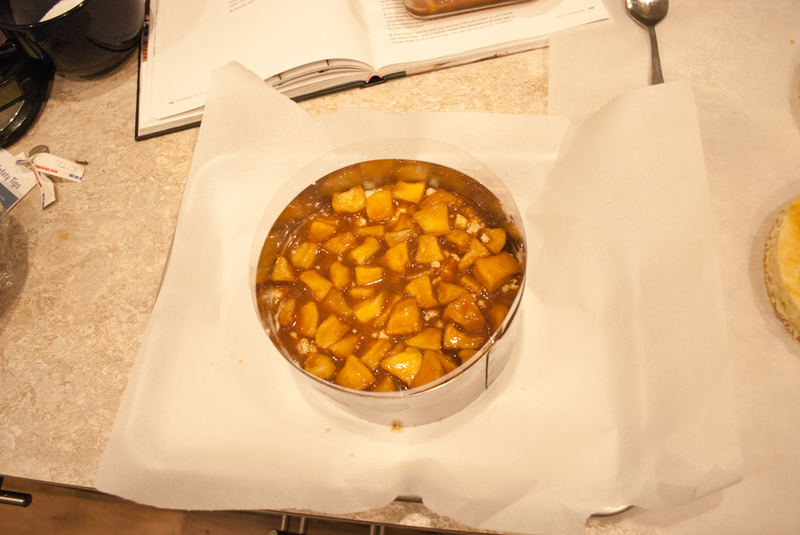 The acetate superstructure for the cake. That's basically one layer of cake. Then it's repeated with the first of the proper cake layers, which is then soaked, liquid cheesecaked, and apple pie fillinged. Eventually, you'll run out of things to put as layers in your cake. This is intentional and a good thing. Because cakes must end at some vertical point. Hey that's why you had that other layer of cake! Finally, the cake is topped with the remaining pie crumb. If you do it the way you're supposed to, it'll go around the edge in a nice looking circle. If you're like me and forgot about that, you can put it all across the top of the cake and it's just fine. When that's all on there, and all the layers are stacked. It heads to the freezer. That's right. It's been nearly 24 hours since I started making this cake and I still have another day before I get to eat any of it. At some point, I'll taste the cake. I can assure you the individual components are quite amazing on their own. The cake is some kind of magic unto itself. Very fluffy and light. The cheesecake is great too. So this thing freezes, then we have to thaw it before serving (which is about 17 hours from now). It's been a fun project, and I think if nothing else kind of solidifies the magic that cooking can provide. Each step along the way makes very little sense in the abstract. But eventually, it comes together and makes a pile of delicious things that you put in yoru freezer and wait another day to taste. The trailer for Lynn Shelton's next project, Touchy Feely is on Apple's trailer site today, and it looks great. Took a walk, saw the sun setting. Then some boats. A few months ago I had the pleasure of talking with Andrew Kim, a designer who over the course of the last year got a lot of (well deserved) attention for a project he did proposing a massive redesign for Microsoft. His latest project, America Elect, was to take a designers eye to the American electoral system. It's a fascinating look at updating a system that is kind of vestigial - in the sense that since the shift to voting by mail, we haven't really looked at changing ballot design (and in some cases are just filling out the same kind of old ballots). It's a really beautiful project, and I have a feeling this won't be the last time we see some big ideas from him. Late last year after the election, I went with my family to Hawaii, specifically to Kauai and Oahu. It was a scenic wonder of a trip. The video was shot with my iPhone 5, which thrives in the bright sun. Sometimes, I'll hit the road (or the skies) and end up shooting some video and stitching it together with a song I like, and then I post it up. 1) The time I drove up to British Columbia, saw a Canucks game (I'm a big hockey fan now), and explored north of the city for the first time. I have another video of my trip to Hawaii last year that I need to post up sometime as well. It's a bit longer, and coincidentally much warmer and causes yearning to get back out to Hawaii at the earliest chance. This is obviously the most important thing you'll read all day. Posting a comparison test tomorrow. Is it weird I kind of miss this?